“Jenn just finished her lecture and she ROCKED!!!!!!! I finally spoke to her a few days later and she said that many came up to her afterwards and told her that they cried during her talk, and some were tearing up even as they were saying this. Because others before her spoke about the same information, she decided to make her speech more informal and to focus on the man, more specifically, her and my memories of her grandfather. Jenn also mentioned that the power point froze in the middle, so while the technicians were fixing it, she did a tap dance! It broke up the audience. Ever since her first ballet recital, I realized I had a “ham” in the family, someone who loves to perform and isn’t shy about doing so. I am proud, of course, but more than that, I feel that this is Jenn’s debut – stepping out on her own and making a big impression with her passion, hard work, and heartfelt sharing of her grandfather in a major venue. That is what I am most proud of. And, that she is finding out what she loves to do and stepping into it in a very bold and public way. This opportunity has been such an honor for her grandfather, for her, and for our whole family. I am proud that she speaks for our present family as well as our ancestors. She is a true representation of our family legacy. Jenn also took the time to find out the home of my birth in Shanghai. Of course, leaving China at age 3, I really don’t remember anything about this home. However, the photo of the home in my birth album does not look anything like the photos she sent me. Of course, my photo was taken in 1943, quite a long time ago. So, I cannot be surprised that the neighborhood has been built up since then. She did not go inside, as it is an apartment complex and people are still living in it. But, looking at the photos, I wish I were there with her to see it. Perhaps, some day that will happen. In any event, I am grateful that Jenn took the time to find it for me. So, as of this writing, the Shanghai portion of the World Congress is over, and Jenn is already in Nanjing, experiencing the next leg of her journey. More to follow when I hear from her. I miss you, Jenn, and know you are doing important work for all our family. I am so proud of you! I was at Jenn’s talk in Shanghai last week and was absolutely mesmerized by it! Many of us had asked Jenn about her talk beforehand and she said she didn’t want to give away any spoilers. Thank goodness, because I don’t think there was a dry eye in the room when she was finished. 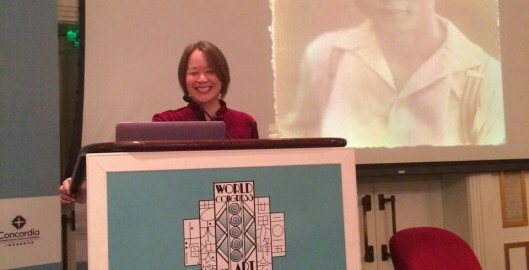 I was lucky to be in the room when Jenn spoke about her grandfather at the World Congress on Art Deco in Shanghai. It was a privilege to be there and for me was the most memorable presentation of the Congress.